The seventh and final Harry Potter book has broken sales records on both sides of the Atlantic, selling 11 million copies in its first 24 hours. 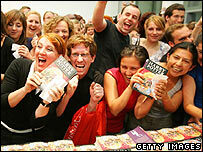 Harry Potter and the Deathly Hallows sold 2.7 million copies in the UK and 8.3 million in the US. The previous record for the fastest-selling book was held by the sixth Harry Potter novel, which sold nine million in its first day in 2005. The long-awaited climax to JK Rowling's series was released on Saturday. It was published simultaneously in more than 90 countries. UK publisher Bloomsbury said: "The response of the first readers to the seventh and final Harry Potter book has been wonderful. "We're grateful to all our printers, distributors and retailers worldwide for the most astoundingly successful book launch ever, and to JK Rowling for the most triumphant close to a magnificent series." A decade after the first instalment, the running total for Harry Potter book sales was already at 325 million even before the seventh novel came out. Author JK Rowling launched the final instalment with a reading session at the Natural History Museum in London, and signed 250 copies an hour for fans between midnight and 0630 BST. Tens of thousands of devotees - many dressed as wizards and witches - turned up to midnight launch parties at 280 branches of book chain Waterstone's, while many more took part in release parties all over the world. UK supermarket Asda said The Deathly Hallows sold twice as quickly as its predecessor. The store, which discounted the book from £17.99 to £5, said it shifted 97% of its 500,000 copies in the first 24 hours. "The nation really has gone Potter potty," said spokesman Ed Watson. The book had a print run of 12 million in the US, compared with 10.8 million for the last book, according to Lisa Holton of the book's US publisher Scholastic. "The excitement, anticipation, and just plain hysteria that came over the entire country this weekend was a bit like the Beatles' first visit to the US," Ms Holton said. "The conversations the readers have been waiting to have for 10 years have just begun. Congratulations to JK Rowling on her tremendous literary achievement."